Contains odour absorbing charcoal to prevent foot odour. Comfortable and durable. One size fits all. Textile. 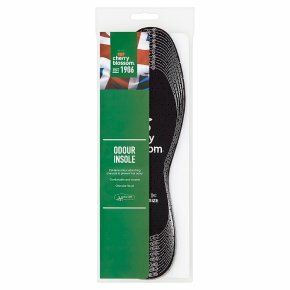 Latex foam with activated charcoal.Cushions and Keeps Feet Fresh Soft textile on a layer of latex foam with activated charcoal for soft walking in your shoes. The perforated structure ensures good air circulation and the activated charcoal reduces moisture and foot odour in your shoes. The soft latex layer cushions your feet reduces foot burning. Fits all sizes, is suitable for all footwear, comfortable and durable in use. Directions: For perfect fit, follow the printed size guide on the insole and cut with scissors to the size required. Will fit Mens, Womens and Childrens shoe sizes.